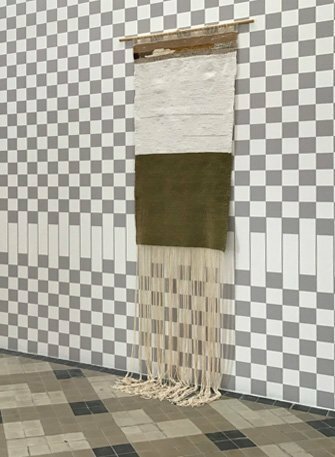 At WIELS, Hana Miletić exhibits work that departs from a feminist perspective on labour and care, such as a series of hand-woven textile works. She studies how certain tasks conventionally assigned to women and/or migrants are undervalued in patriarchal, capitalist societies. In her practice, Hana Miletić takes a critical look at social and political issues in European cities and focuses mainly on the careful (re)presentation of stories of migration. Hana Miletić wants to investigate the emergence of subjectivity, both at the level of the individual and at the level of the community. Her approach reveals the parallels between our practices of looking and our perception of value. Previously, documentary photography was at the heart of her artistic practice. Nowadays, she hardly ever uses photography as a working tool to do socially engaged work that leads to new areas of interest. Instead Hana Miletić welcomes exchange and collaboration in her artistic practice, because in doing so she is able to create a dialogue; something which she considers to be a necessity given her relation to the changing social reality. 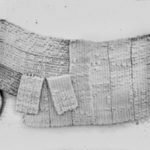 Hana Miletić became active in community weaving workshops in Brussels three years ago, reconnecting with a craft from her childhood in Yugoslavia. Working with textiles weaving has been passed down through generations of women in her family. After the fall of the Communist regime in Croatia, many textile factories were forced to close as a result of the privatisation process. For many women, however, it meant an incentive to enter into and intensify partnerships and to develop alternative DIY production methods. Typical of this transition is, for example, is the Croatian women’s association ‘Open Kamensko’, a self-organising collective of former factory workers who are now freelance textile workers. 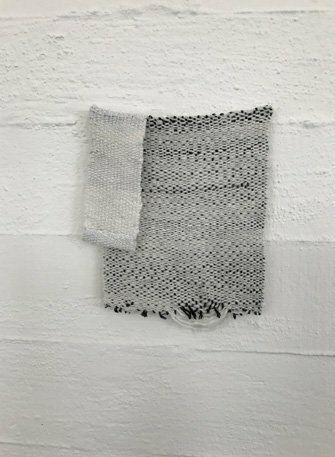 Weaving on a handloom is a repetitive and lengthy process, which allows Miletić to reflect on issues of social engagement and reproduction. She has developed a weaving practice that allows her to connect with a family rooted craft on the one hand and, on the other hand provides her with time to engage with its metaphorical social implications. Her cultural roots inform her work, while her research reflects the consequences of political practices and economic influences that recurs across time and place. Via re-enactment and scrutiny, she addresses inventive approaches to scarcities, damages and obstacles. Her goal is to bring minor actions and practices to attention and committing to the subversive potential of finding alternative modes of dealing with existing measures, administrations and ideologies. She describes weaving as “reproductive labour”, a term associated with the materialist feminist tradition of the 1970s, which sees gender as a social construct. Specifically, she looks more closely at how care work – a role conventionally assigned to female and/or migrant workers – is undervalued in patriarchal, capitalist societies. Care-giving and care-taking are at the heart of Hana Miletić’s practice. 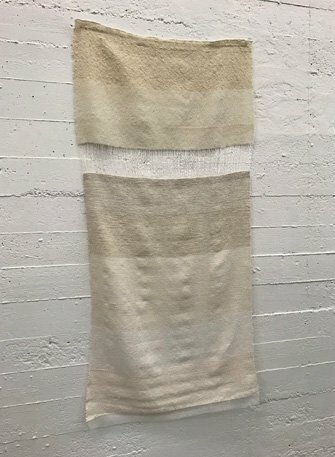 In this exhibition we see handwoven works. 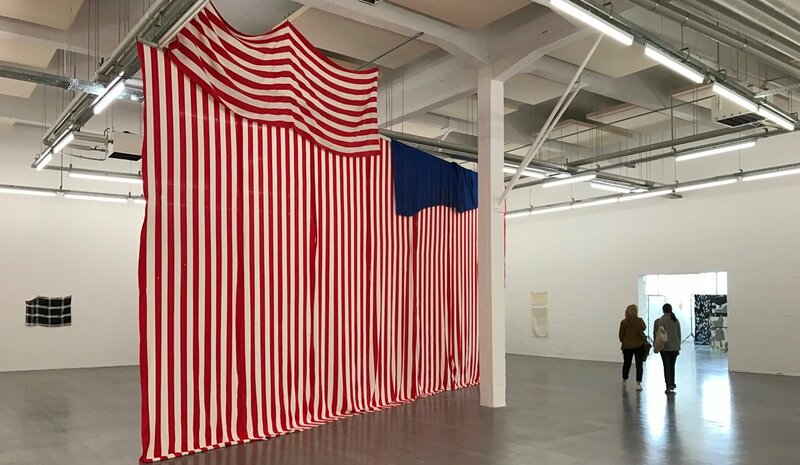 Some on a very large scale, like the voluptuous red and white stripes, together with the pitch-black/blue cloth, a large installation. Both consists of many meters of linen binding, woven by the artist herself on a 6 shaft loom. These two bodies, striped and plain, agreed to meet upon the artist’s invitation. It’s a very lively and inviting combination which incorporates a very stark contrast. It refers to identity, nationality and home, as this tactile work cleverly divides the artificial lit WIELS space on the 2nd floor in compartments of different sizes. Some diagonal some parallel. In doing so the installation produces new angles and welcomes the viewer to become part of the shielding provided. In this exhibition there are also some intimate sampler type works in pastel tints. They remind me of the early Sheila Hicks mini-works. In contrast to the installation, these small works are placed on the wall while bright daylight enters the exhibition space. They all demonstrate an attractive quality of innocence. This callowness is being brought into the works as the artist purposeful add irregularities and “mistakes”. These add a sensitive aspect to the works. Hana Miletić practises similar interventions with the large scale works, however, these intervention feel treacherous as they result in draping and therefore state an intriguing opposition. The felt works are community workshop products made from imported pre-dyed Irish wool. Somehow, these works do not fit the story and may not reach into the deeper layers of socio-cultural critique. The presentation on tripods seem too far fetched. The painterly appearance is pleasant enough, the way the works are positioned in the space is deliberate, the colours are nicely balanced but for me these works represent an artist directed communal event rather than the transience of a work of art. Hana Miletić (b.1982 Zagreb in Yugoslavia), lives and works in Brussels and Zagreb. With a background in documentary photography, she creates work in various media, including sculpture, textiles, performance, printed matter and text. In addition to photography, she also studied art history and gender studies, all of which inform her practice. In 2015 she was a resident at Jan van Eyck academy, Maastricht. Hana Miletić was nominated for many prizes amongst others in 2015 for the Young Belgian Art Prize. She was the winner of the Fondation Henri Servais Prize. In addition to this exhibition Dependencies, the reading group Knowledge Is A Does, that started in 2014 at the Jan van Eyck Academy in Maastricht, including Miletić, presented an accompanying event. This evening for theory and poetry called Disassemblies took place in the Beursschouwburg in Brussels a few days before the opening of the exhibition at WIELS.